For many musicians, social media has become the center of the universe when it comes to music promotion. To build a base of legitimate, long-term fans, it helps to establish a presence online and deliver a prolific level of high-quality content to keep them entertained and excited about what you do. 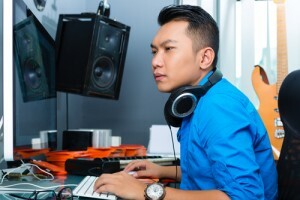 While social media platforms like Facebook and Twitter typically play prominent roles in an artist’s music marketing strategy, creating a musician blog is often is overlooked. A blog gives you the opportunity to discuss things you are passionate about. It can revolve around your music or musicians that influence you, but you can also explore other things that are part of your life, like the wild cooking you do on a regular basis, social commentary, your daily or weekly sources of inspiration, tour and recording updates, etc. A blog creates an opportunity to connect with people who could be fans on a direct, more personal level. If you can relate the content of your blog to your music and creative endeavors, this can then tie in to creating a narrative that expands your musical persona. Of course, a blog also allows you the opportunity to more directly and deeply connect to your existing fans. Through the comments section, readers can offer their own experiences and insights and continue the discussion with you and other fans. This is community building at its best. A blog really gives you the opportunity to flesh out ideas, expand upon your passions, and hone your voice. Defining your voice is a critical step in creating a noticeable brand and presence within your community, be it on a local (Brooklyn, NY), regional (Northeast, US), national, global, or niche community. Blogging helps drive new traffic to your website. Each blog post is another high-quality link that is entered into the Google database. When people are searching topics relevant to your blog, your name and your website can start showing up the more you post about a topic. What type of content should you publish? Be it news about yourself or news about a community you belong to, these blog posts are typically short, straight to the point, and very frequent. If you are someone deeply driven by a particular passion, you have a great opportunity to share your experiences and lessons to others in form of advice-driven content. These posts don’t have to be long, but you certainly want to make sure your advice is well thought-out and clear before you publish your article. This type of content is not for everyone. It takes a deep understanding of a topic and the confidence to accurately analyze topics in a way that is insightful, enlightening, and engaging. If you feel you can adeptly offer up analysis, this content is one of the best opportunities to define your voice and can even help to develop your thought-leadership within your community. How often should you be posting to your blog? Before addressing blog post frequency, it is important to note that consistency is everything when it comes to a blog. If you begin your musician blog posting every day for two weeks, and then don’t post again for a month, people will think your blog is dead and will move on. It is always best to define how often you will publish and stick with that right from the start, even if that is once a week, or once every other week. It’s also much easier to increase the frequency of posts, no matter the type of content, than it is to scale it back without losing readers. The frequency of your blog depends on two things; your availability and the type of content you publish. Your availability should certainly be the first thing you consider: if you only have one hour per week to dedicate to blogging, you may want to avoid trying to be the source of news for your niche. Once you know how much time you have available and can pick your style of content accordingly, you can then determine the number of posts to publish per week. News needs to be topical in order to remain relevant, so this style of content dictates that you post as often as necessary to cover the latest developments. Unfortunately this means you could be posting several times per week. Of course, this is only unfortunate if you don’t have the time. If you do, this is a great way to constantly deliver great content to your fans. Advice and analysis content are not always dependent on a specific timeframe, so you can really define this frequency yourself. I strongly suggest that any blog be updated at least once every other week. More than that is totally fine, and welcome by most (especially if the content is good! ), but you certainly wouldn’t want to publish less than this. There are several blogging platform that offer free (or inexpensive) blogging and content management solutions. Each platform has pros and cons. By far the biggest blogging platform on the internet. WordPress is actually two platforms, WordPress.com, which offers a good beginner option with basic hosting and limited customization, and WordPress.org, which offers a massive open-source community of developers and designers who have built every possible theme, template, widget, plug-in you could possibly need. Cons: Not nearly as easy a user experience as it is claimed to be, and a good WordPress designer can be costly. Owned by Google, Blogger.com offers a similar experience to WordPress, albeit more limited in the customization opportunities. Pros: Owned by Google and therefore highly integrated with Google+, Google Analytics, and Google’s RSS solution ‘Feedburner’. Cons: Fewer customization options than WordPress, and Google has been known to completely kill off platforms that it no longer supports (such as Google Reader). While Blogger does have a fully dedicated community, this is always something to consider if you are dedicating yourself fully to their platform. More of a ‘micro-blogging’ platform than WordPress or Blogger, Tumblr offers a blogging and blog-discovery platform focused on short hand multimedia content (think Twitter with a focus on visual media). Pros: Highly integrated with social media; free and simple to set up. Cons: No native commenting means severe lack of real conversations happening on Tumblr blogs. Founded by Evan Williams of Twitter fame, Medium is a brand new blogging platform that aims to take the social integration and discovery functionality of Tumblr, and combine it with WordPress’ focus on long-form content. Pros: Beautiful, highly integrated with social media, a focus on real conversations through commenting. Cons: Still available by invite only, though this will change as the platform grows. Squarespace offers a fully-hosted environment for creating and maintaining a website. Known for its sophisticated yet easy-to-use interfaces, Squarespace’s do-it-yourself tools allow you to quickly and easily create and maintain a high-quality website or blog site. Pros: Beautiful design templates that are easy to use and customize and are web and mobile ready. Cons: Uses CSS3, which means updated browsers won’t display the content correctly. Now that we’ve explored the ins and outs of getting yourself set up with a musician blog, it is time to blog. There are several simple things you can do to optimize your blogging efforts, each of which ensure that with every post you publish, you’re taking advantage of every opportunity to interact, build your community, and convert fans to customers. Unlike any other marketing tool, you can only know how effective you are if you can analyze the data found within. By setting yourself up with an analytics engine, such as Google Analytics, you can dive into each blog post to determine which posts best connect with your audience, which allows you to better understand who your audience is and where they come from. High quality photo or video. Visual media of some kind, be it a high-quality photo or an embedded video, will help to attract attention to your blog posts. Sometimes, asking readers to share their comments and insights is necessary to get the commentary flowing. Of course, if you want people to comment at all, you need to make it possible for them to do so. Most blogs now come with commenting built in (except for Tumblr), but you still may want to use something a bit more powerful, such as Disqus or IntenseDebate, which are far more integrated with social sharing. Speaking of social sharing, you definitely want to make sure you use a simple plug-in on any blogging platform you chose to ensure that every blog post has the standard social buttons, including the Facebook ‘like’ button, Twitter ‘Tweet’ button, Pinterest ‘Pin’ button, Google+ ‘+1’ button, and the StumbleUpon ‘Stumble’ button. There are dozens of options here so choose the buttons that best reflect where you and your fans spend time online. Jon Ostrow is a regular contributor to Disc Makers Echoes blog and is the Campaigns Director for Cyber PR. Follow him on Twitter @jon_ostrow.